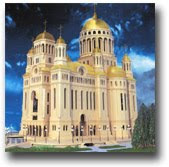 There are a variety of architectural styles within the Orthodox world, each with its own distinctive features and origins. Of course, many of the earliest churches were of the basilica style, often comprising three aisles separated by rows of pillars. The floor plan of such churches is somewhat different from 18th and 19th century churches found in Russia. Within the various cultures the Church found itself, a variety of styles developed. There are, however, similarities found in each of these variations. The focus of all Orthodox churches is the altar, which is separated from the rest of the church by the iconostasis, or icon screen. In the center of the altar one finds the altar table, upon which the Eucharist is celebrated. The altar is considered the "holy of holies" within an Orthodox church, for it is here that the Holy Mysteries are celebrated and the Body and Blood of Christ is reserved in the tabernacle on the holy altar table. The Book of the Gospels also rests upon the altar table. Only those who have specific functions within the altar are permitted to enter it. The main part of every Orthodox church is known as the nave. It is here that the faithful gather for worship, that icons are available for veneration, that the singers, readers and chanters fulfill their functions, etc. Those in the nave focus their attention on the altar, in which the celebration of the services and sacraments is based. They also focus their attention on those liturgical rites which take place in the nave, such as the reading of scripture, various processions, the celebration of baptisms, weddings, and funerals, etc. Finally, the third part of every Orthodox church is the vestibule, or narthex. Traditionally this "entryway" into the church is somewhat larger than we are used to finding in North American churches, as one can clearly find if one visits ancient Orthodox churches throughout the world. Not only does the vestibule serve as a "buffer" of sorts between "the world" and "the Kingdom" as represented by the church building proper, but it also has served a variety of purposes at different times and in different places. There are also certain rites which are conducted in this part of the church, such as the exhorcisims which precede the sacrament of Baptism, the betrothal at weddings [in some Orthodox communities], the prayers of churching after birth, etc. On designated occasions certain Vesper prayers and rites are also celebrated here. Generally, Orthodox churches are surmounted by a single dome or a series of domes, with the traditional explanation being that the central dome, in which an icon of Christ the Pantocrator is generally depicted, represents the heavens. 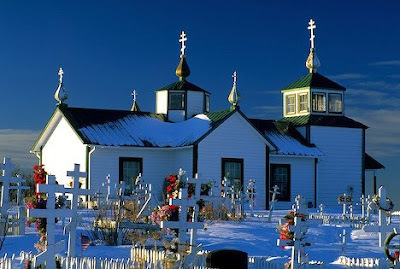 One may find Orthodox churches with one, two, three, four, five, or more domes, depending on the architectural style of the church. A variety of meanings have been appended to the appearance of domes, most dictated by popular piety rather than deep theology. For example, a five-domed church is often seen as representing Christ surrounded by the four evangelists; a three-domed church is seen as representing the Trinity; and so on. There are a number of schemes which have been followed in the interior decoration of Orthodox churches, especially with regard to frescoes and other iconography. In conclusion, I would suggest that one visit a variety of Orthodox churches, which will bring to light the various traditions associated with and reflected by the architecture of the Orthodox Church.